On 5/16 I inspected both hives with Brooklyn Homesteader Megan Paska. Megan generously offered to help me inspect and point out how to identify the cells with brood in various stages. At three weeks, you are checking to make sure your queen(s) are alive and laying plenty of eggs in regular patterns on the frames. We saw both queens! They were waltzing around the center frames like the hihat ladies they are. Hive South was farther along in terms of comb the workers had drawn out (about 7 of 10 frames), and we added a second medium to it because it looks like they will soon have drawn out all ten frames. The comb was white and thick and you could see tiny sickle-shaped eggs in many cells. Other cells were filled with pollen, which ranged from rich yellow to dark red; see example from flickr below. Other cells were filled with nectar, which is shiny and clear, like dew. It was a big relief to have another set of eyes and hands with me to confirm the queens are laying at a good rate. 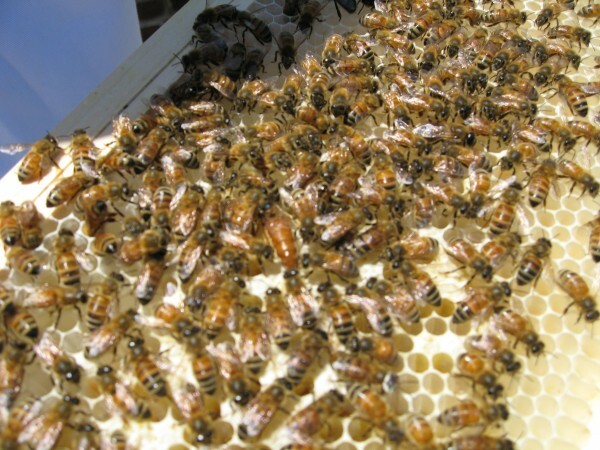 In the spring a queen can lay up to 1900 eggs every day. She inspects a cell for cleanliness, lays the tiny egg, and then a worker attaches the egg to the cell with a mucous strand. The egg hatches into a larvae, and nurse worker bees feed the larvae royal jelly, which is a secretion from the worker’s neck glands, for two glorious days. If the larvae is destined to be a queen, she would go on being fed royal jelly, but worker bee larvae are switched to a blend of diluted nectar and pollen called brood food. At 6 days old, the larvae is capped and underneath the wax cap it undergoes a metamorphous. It emerges 10 days later as a fully formed bee. When I inspected I saw brood in all of these stages — eggs newly laid, larvae before it was capped, and capped brood. However my photos are all blurry so these are from flickr. Yesterday was the three-week anniversary of the HiHat queens roaming freely among their subjects. So if the queens started laying the first day, then right now the first births of the next generation are happening in my hives. My first natives! A cell filled with royal jelly in the center with the larva. Loading the hives for the transhumance takes place at dusk. Monsieur and dear colleague, are willing to send me the pictures in high resolution and permission to use your photos. I beg you to believe Monsieur and dear colleague, to my considerations. PS: Especially in 300 DPI.